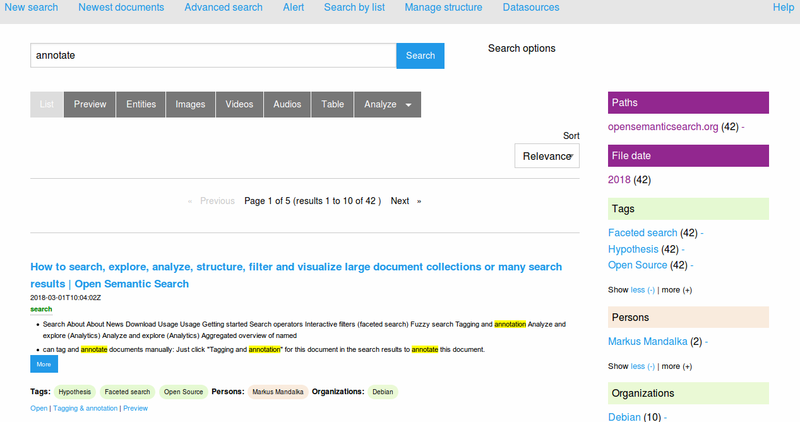 Open Semantic Desktop search is free open source software for your own desktop search engine with integrated text analytics and research tools for full text search, exploratory search & text mining in large document sets, many PDF files, Word documents and many other file formats on Windows or Mac. The free software Open Semantic Desktop Search based on Open Semantic Search is the all in one package for desktop users (including Solr search server, user interfaces, open source search tools and connectors) as virtual machine image for full text search, exploratory search, analytics and text mining in many documents on your own desktop computer or notebook on Linux, Windows or iOS (Mac). Like described in the tutorial with screenshots how to install and configure the Open Semantic Desktop Search virtual machine just import the appliance file into Virtual Box and in the settings of the virtual machine add shared folders pointing to your documents directory or directories. Start the virtual machine "Open Semantic Desktop Search"
Indexing documents from all configured shared folders will be started automatically after starting the Desktop Search virtual machine. 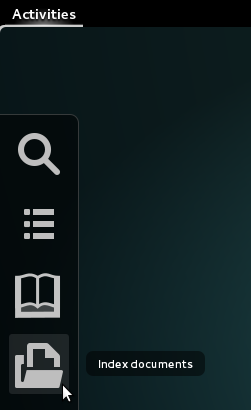 InvestigateIX integrates Open Semantic Desktop Search as preconfigurated search engine and desktop environment with an Linux live-system on an encrypted external device like an usb key or an external harddisk for end users with sensible data and enhanced privacy needs like investigative journalists without dedicated server or laptop and for unhosted searching.